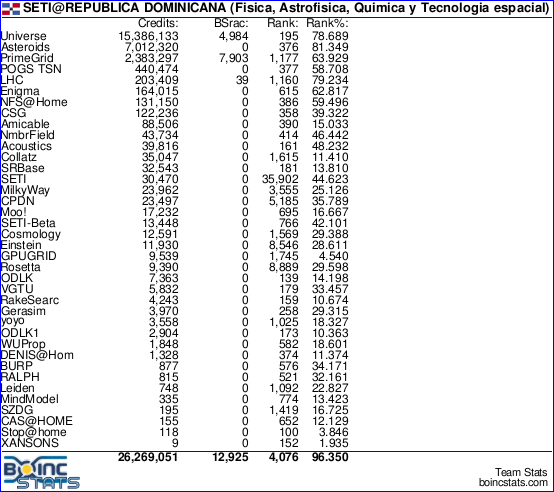 Description Usuarios activos del SETI@REPUBLICA DOMINICANA (Fisica, Astrofisica, Quimica, Bioquimica, Medicina y Tecnologia espacial). Proyecto de pruebas de SETI@Home (http://www.seti.org) y buscar evidencias de radio de vida extraterrestre. The Institute comprises three centers, the Center for SETI Research, the Carl Sagan Center for the Study of Life in the Universe and the Center for Education and Public Outreach. Founded in November 1984, the SETI Institute began operations on February 1, 1985. Today it employs over 120 scientists, educators and support staff. Research at the Institute is anchored by three centers. Dr. Gerry Harp is Director of the Center for SETI Research (Dr. Jill Tarter continues as Bernard M. Oliver Chair for SETI.) Dr. David Morrison is the Director for the Carl Sagan Center for the Study of Life in the Universe. Edna DeVore leads our Center for Education and Public Outreach.